For use either as a supplement or a stand-alone text, this brief, inexpensive collection of chapters from market-leading introductory college textbooks gives students essential practice in reading across the disciplines. Beginning with a chapter on college success, The Bedford/St. 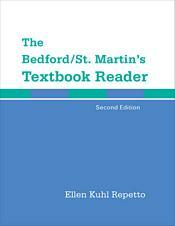 Martin's Textbook Reader also includes chapters from current texts on composition, mass communication, history, psychology, and environmental science. Comprehension questions and tips for reading success guide students in reading college-level materials efficiently and effectively.